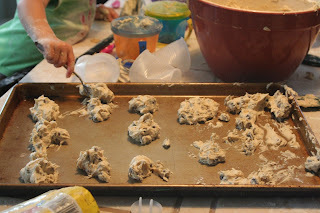 In a burst of ambition, or maybe it was temporary insanity, I decided to show the kids how to make chocolate chip cookies. We all gathered around the island and we baked Food Network style, with a play by play of what was going on. 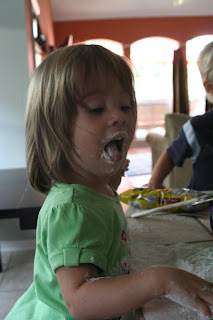 It wasn't long until the play by play was just playing and flour was everywhere. They kept getting into the dry ingredients bowl taking out the flour with the spoons I'd given them for when it was their turn to stir. 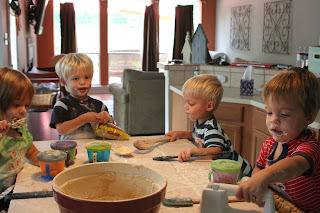 So I thought, I'll just give them each their own little cup of flour and they can play with that and not the actual recipe. It was hysterical. I told them "do not eat this, just play with it with your hands and spoons." As soon as I said that I turned around to get something and when I turned back everyone had little white beards from taking a big "drink" of the flour. The laugh I got from that surprise was worth all the mess! 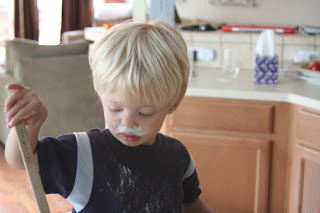 Speaking of mess, it's been a few days since the cooking show and I still can't get all that flour cleaned up. This is definitely a project that should always be done at Grandma's house! "Mom, you should totally use this for teeth whitener, look it works!" 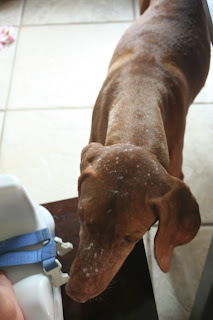 "I'll take it from here..."
Even Jaz got in on getting floured! I just giggled through your post...seriously HILARIOUS and SUCH a learning experiance though! HOw fun! Hmmm.... I may have to try that. I love making chocolate chip cookies. Next time do the project outside! The hose works well for a fast cleanup anytime! 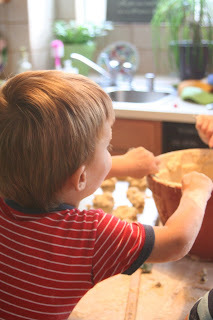 We like to buy the ready made tollhouse dough,and the kids love to help spoon it out onto the cookie sheets. 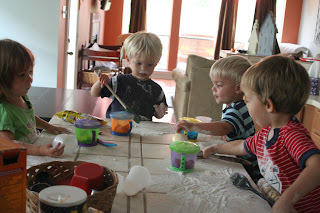 Less mess and fast results for impatient kiddos! Absolutely LOVE it!!! so cute - we miss you dearly!! What a great memory though!! Awww I want one, how sweet is that!